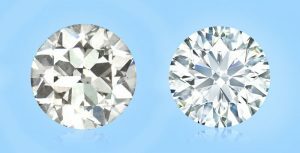 There are few changes in the history of diamond cutting that were as drastic as the evolution of the Old European cut diamond. This process spearheaded the evolution from old mine cut diamonds and led to the modern, round brilliant cut diamonds. To learn how to identify Old European cut diamonds, study the guide below. The old European cut diamond is the standard round diamond that was made between 1890 – 1930. As a predecessor to the modern brilliant cut diamond, the old European (or old Euro) cut diamond strongly resembles the modern brilliant cut diamond. The old Euro is very popular among vintage jewelry collectors. Until the mid 1900’s, if someone needed a diamond, it had to be cut and measured by hand. The diamond cutters at the turn of the century used only their eyes to measure for precision. They cut and polished their diamonds for maximize sparkle against candlelight. The Old European cut diamonds were handcrafted from 1890 – 1930’s. Rounded diamonds that were cut before 1890 are called old-mine cuts. 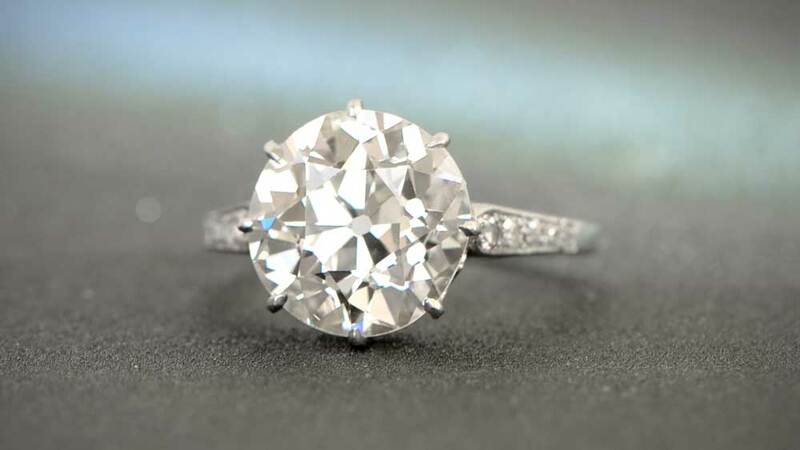 Round diamonds that were cut after 1935 are called either Transitional Cut or Modern Round Brilliant Diamonds. Old European cut diamonds were the diamond cut that was used in almost all rings made at the beginning of the 1900’s. Most antique jewelry from that Era used Old European cut diamonds, old mine cut diamonds, rose cut diamonds and single cut diamonds. Old European cut diamonds are also known as old euro, round old mine, and European cuts. The important sections of a diamond include the table, culet, crown, girdle, and pavilion. Each of these sections is angled and faceted to create brilliant sparkles. One of the hallmark of the old European cut diamonds is its visible culet. To view the culet, you can peer through the top of the diamond. On a diamond larger than 1 carat, you can find the culet without even using a loupe. Take a look at the rounded facet in the diamond of the picture above. Frosted girdle. (The girdle is the facet that encircles the diamond between the crown and pavilion). Read more. Old European cut diamonds have the same number of facets as modern diamonds: 58. Larger facets than modern diamonds. Looking to discover how to tell if a diamond is antique? Read our definitive guide! Hand-cut and unique. Jewelry cutters made each Old European cut diamond by hand. Inner fire. See below for an explanation. Old European cut diamonds usually come set within antique rings. Rarity. With passing time, less and less old European cut diamonds are available for sale. Price. Old European cut diamonds are only available on estate websites, and so the prices are usually a lot better than brand new diamonds. Imperfect Cuts. Handcrafted diamonds will never have as perfect a shape as a laser-cut modern diamond. Options are scarcer. 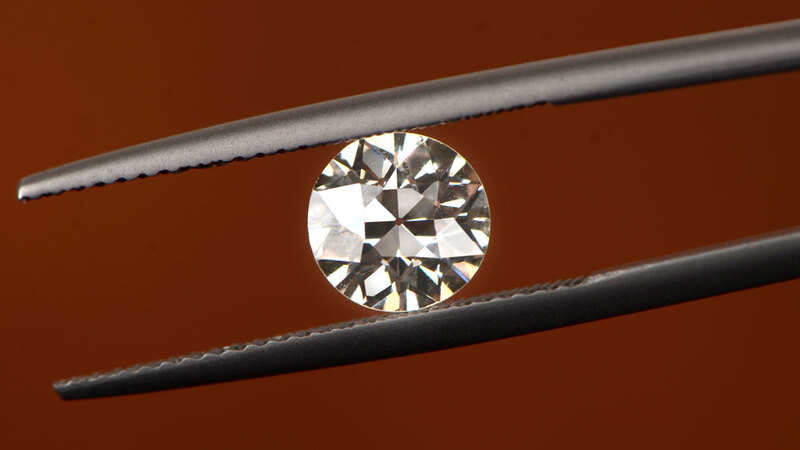 Due to the rarity of old Euro diamonds, the variability is less. Vintage collectors are always talking about the advantages of Old European cut diamonds over modern diamonds. In addition to the clinical differences, as mentioned earlier, collectors always mention the “inner fire” of old Euro’s. Inner fire is a hard metric to quantify, but because the diamond specifications are different, the way they react to light is different too. Diamond experts changed the diamond proportions in the 1930s, and the changes created more sparkle in the diamonds. Many believe that it was the modern angles that caused the diamonds to lose the inner fire. Old European diamonds typically show larger face-up patterns of light and dark—what might be described as a “checkerboard” pattern by a non-jeweler. The modern brilliant diamond displays a tighter mosaic of light and dark patches often labeled as “splintery” by those who prefer older cutting styles. When considering an Old European cut diamond ring, what matters most is your opinion. Some people believe that antique cut diamonds retain the artistry and grace associated with fully handcrafted pieces, while others prefer the exact measurements and precise design of modern tools. Estate Diamond Jewelry has been collecting vintage jewelry for over 30 years and is proud to share their rare collection of old European ring collection online. Click here to view our entire collection of Old European cut diamonds. If you have any questions, please feel free to ask us.